—Who might consider the reverse about 2017, and why. —Lead-up to Graeme’s hour, re polls and polling, oriented to polls concerning the “war on terror,” who was responsible for 9/11 (and subsequent false flag ops). I’ve had an interesting experience with one questionable US polling firm, vis a vis the above, that I documented. Second hour: McMaster University Professor Emeritus Graeme MacQueen joins us to discuss his new article “9/11 Truth: British Muslims Overwhelmingly Reject the Official 9/11 Story. The article covers a new poll, commissioned by neocon 9/11 suspects themselves (such chutzpah!) showing that only 4% of British Muslims believe the official version. 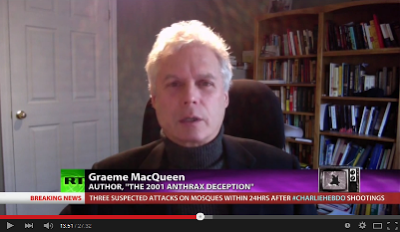 You may also want to check out Graeme MacQueen’s other appearances on Truth Jihad Radio, including: Prof. Graeme McQueen’s new book: “Anthrax part of neocon 9/11 false flag op” — on Kevin Barrett’s Truth Jihad Radio. This show was broadcast on January 1, 2016. This entry was posted on Saturday, December 31st, 2016 at 10:58 am	and is filed under 9/11, Anti-War, Censorship-Propaganda, Disaster Capitalism, Econo, Education, False Flag/Fake Terror, Freedom, Geopolitics, Justice, Kevin Barrett, Law, News, Politics, Protest. You can follow any responses to this entry through the RSS 2.0 feed.